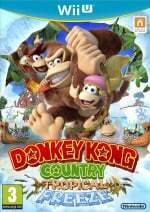 To help celebrate the launch of Donkey Kong Country: Tropical Freeze, you may have heard of Nintendo Canada's pretty extravagant contest, Banana Mania. With everything having wrapped up last month, we're all now able to get a peek behind the scenes and see exactly how it was done. A video of stills and unseen footage opens with the shocking revelation that Donkey Kong needs to be hired for promotional use. You'd think he'd be eager to promote his own game free of charge, but given that the only bananas on set were buried in ice, it makes a little sense. From there, we see the multi-tiered setup of the crate's interior, installation of the banana lab (complete with Donkey Kong mug and some suspicious blue crystals..), and even a little NES Remix on the go. So while the contest winners take to the slopes or settle down with their brand new Wii U systems, you can watch the video below and feel just a little bit involved, while waiting on the ''I can't quite get this confetti to pop'' DLC pack to (never) release. Best of all, every single banana was donated to the Greater Vancouver Food Bank, despite some complaint from an ape who wishes to remain anonymous. Seen this already but don't live in Canada. You people over there and in the US are really lucky! I beat the 2nd boss today and immediately did every level in world 3...DKCTF is friggin amazing! DKCR looks/sounds bland compared to the majestic quality of TF. I haven't got playing Tropical Freeze as much as I'd like so far, but what I have? It's been awesome I love it. Highly recommended everyone! @GamerOZO don't go starting with the first thing all over again. Thankfully those weren't his bananas, or he would have jumped on everyone because they stole his hoard, as he does in every game. I guessed 100 000 bananas. Still don't know why.